As a company we started as telecommunications consultants in the Atlanta area 16 years ago, we are in turn, deeply rooted in the technology arena. From the beginning we have targeted helping companies who were moving, restacking, or simply opening their first office. After referring voice & data cabling, phone systems, A/V, and security services to other companies for years, we quickly realized that if we wanted it done right, we should do it ourselves! So, for the last 12 years we have prided ourselves on being a business that can encompass all of a tenant’s low voltage needs. From the service, to the product, all the way through to the installation, we can provide it. We have made it our goal starting with our very first hire, to select only the most skilled technicians to join our team. Our priority is to ensure that each and every client’s installation runs smooth and is completed on time. The Itelnetworks Management Team. 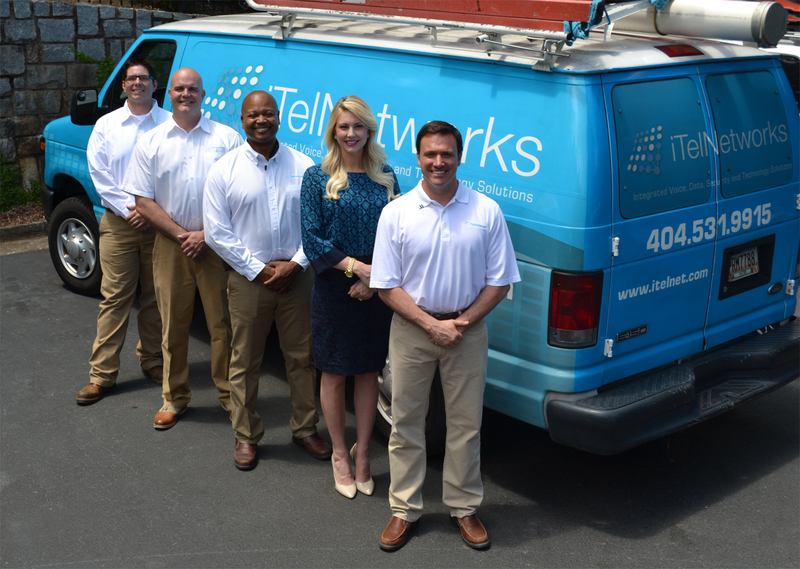 Pictured, from left to right: Mike Holnaider, Project Manager; Will Calvert, Project Manager; Eric Ramey, Project Manager; Kelly Lundberg, Director of Business Development; Blair Brookins, CEO.